1. Weak European data: European markets and U.S. stock futures are slipping lower Wednesday. 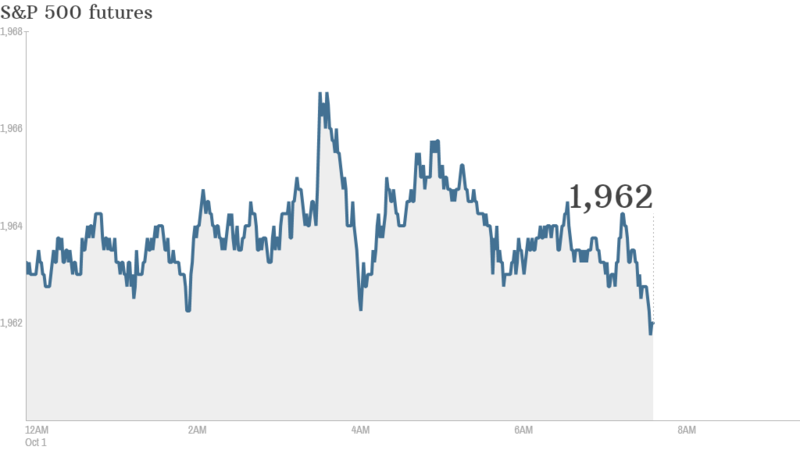 Weak economic data from Europe are keeping investors cautious in early dealing. Manufacturing in the eurozone has stalled, and is now contracting in Germany, the region's biggest economy, according to the latest survey of purchasing managers. The euro continued its recent slide against the dollar. 2. September slump: U.S. stocks closed lower Tuesday, ending September in the red. The Dow lost 28 points while the S&P 500 and Nasdaq slid nearly 0.3%. It was the worst monthly performance for the S&P 500 since January, finishing down 1.5%. The Nasdaq -- the main gauge of tech and biotech stocks -- lost 1.9% over the month. 3. Hong Kong protests: Markets in Hong Kong, and mainland China, were closed for the National Day holiday, which saw huge crowds throng the street of Asia's financial hub. Thousands of Hong Kong residents are taking part in another day of pro-democracy protests. Most other Asian markets ended weaker. 4. Market movers -- Ebola stocks, Ebay, Adidas: Shares in biotech companies Tekmira (TKMR) and BioCryst Pharmaceuticals (BCRX) surged premarket after the first case of Ebola was diagnosed in the U.S. Tekmira is part of an international consortium conducting clinical trials in West Africa. EBay (EBAY) shares were giving up some of Tuesday's gains posted in the wake of its announcement that it will spin off PayPal into a separate company next year. The stock was down 1.7% premarket. Adidas (ADDYY) was top gainer in Europe after it announced plans to buy back shares worth 1.5 billion euros. 5. U.S. economic data: At 10 a.m. ET, the U.S. Census Bureau will say how much was spent on construction in August. The Commerce Department will post the number of cars and trucks sold in September at 2 p.m.